Have you heard about the latest trend called Assisted Living? 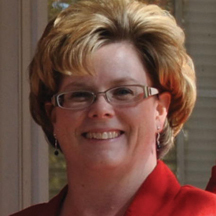 Most people confuse assisted living communities with skilled nursing facilities. Well, let’s clear up all the confusion. Assisted Living communities are licensed entities that provide a variety of services that allow our aging population to remain independent for as long as possible. Assisted living amenities have been created to meet the needs and wants of the residents for which they serve. These communities provide comfortable, home-like atmospheres while incorporating security and monitoring systems to assure the safety and well being of each resident. Residents are given the opportunity to interact with a community, family members, and friends either within the community or outside. Three delicious meals a day in an elegant dining area, 24 hour staffing, an emergency alert system, assistance with activities of daily living (as needed), weekly housekeeping and linen services, social and cultural activities, physical and occupational therapy services, transportation, and medication management (if needed) are just a few of the wonderful features of assisted living communities. Residents and/or family members decide on just the right private apartment to suit their needs. 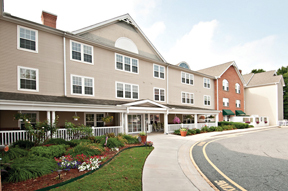 Marvelous public spaces, dining rooms, lounges and gardens are all a part of the assisted living experience as well. Individually tailored programs for personal services insure that each resident and family expectation is not only met, but exceeded. Assisted living communities encourage and aid residents with achieving their own maximum potential. By providing these services, the resident and family members can reduce their stress levels and enjoy their life to the fullest. All of this is done by offering affordable and stylish alternatives to having the worry of maintaining a home. State Street Assisted Living is an assisted living community that is conveniently located in historic downtown Dover, Delaware. This facility offers all of the above quality services, as well as, a secure memory unit for those with memory impairments. 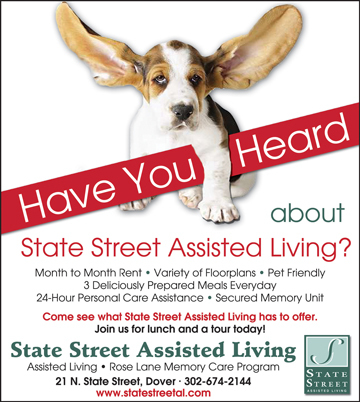 If you are looking for a home that will allow you or your loved one to experience independence, security, and a variety of activities, then contact State Street Assisted Living. For more information or to tour the community, please contact Kristy Handley, Marketing Director at (302) 674-2144 or check out their website at www.statestreetal.com. John Pribanic has been a resident at State Street Assisted Living for 7 years. After 2 serious falls resulting in a broken shoulder and elbow, and broken hip, he moved in with his son, Tom Pribanic for 2 years. Living with Tom helped John gain his strength back, and soon allowed him to live more independently. In June Mr. John Pribanic will turn 103 years young. His family at State Street wishes him a very Happy Birthday! ← Previous Story What Did You Say? How’s Your Hearing? Next Story → Why Do People Pre-Plan Funerals? Peace Of Mind.